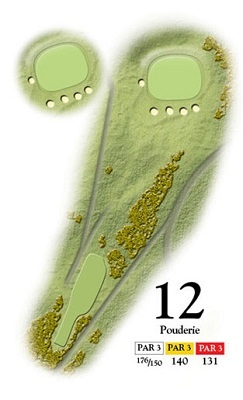 First of only two par 3`s on the back nine and the tee shot must be with the correct club, the green is protected by four greenside bunkers to the front and a deep pot bunker to the left. A grass hollow to the rear means your tee shot must be accurate to find the deceptively large putting surface. A par here is never bad but a good tee shot will set up a great birdie chance.